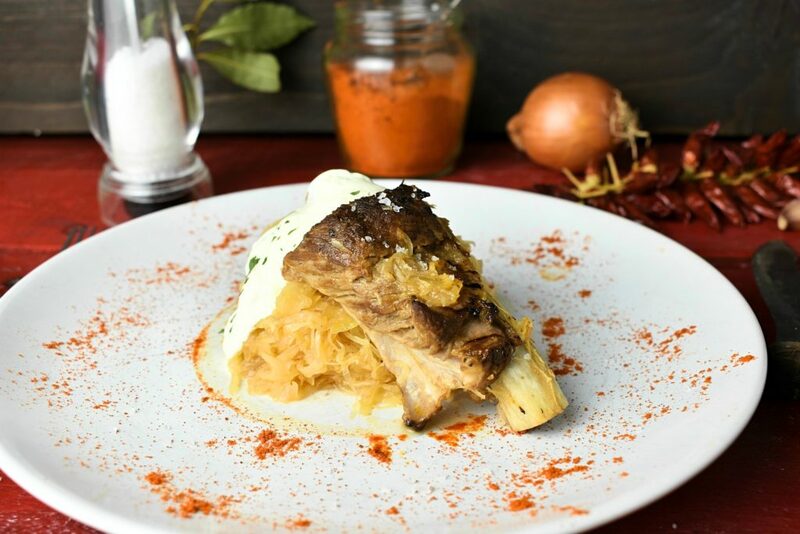 Sauerkraut is not only a garnish on hot dogs and bratwurst. It’s a totally edible, tasty and surprisingly healthy food. It’s a rich source of vitamin C during the winter months if oranges are not our thing. It’s also a recommended food for sufferers of various skin problems and illnesses. No wonder, it’s so popular. It’s sour taste comes from the lactic acid that is the result of the fermentation process induced by various airborne bacteria. When the fermentation is done it can be kept for months in an airtight container at 60°F / 15°C without any problems. Its greatest virtue -and the very reason because it spread all around the world- is it’s edibility long after it is prepared. This was an important factor in times and ages when refrigerators weren’t invented. Keeping something edible for six months was more than enough reason to like it. Although, it’s good for our well being this isn’t the main reason it is consumed all around the globe for centuries. Originally the fermented cabbage idea came from China but the recipe was modified on it’s way to Europe swapping the rice vine to salt. Central and Easter Europeans were the biggest fan of it but it spread all across the continent as a main dish or as an ingredient in some meal. Probably one of the most well known usage in the western world using the Sauerkraut -which is a German word meaning “sour cabbage”- is on the side of a Bratwurst. Or on top of hot dogs which is basically the same thing. 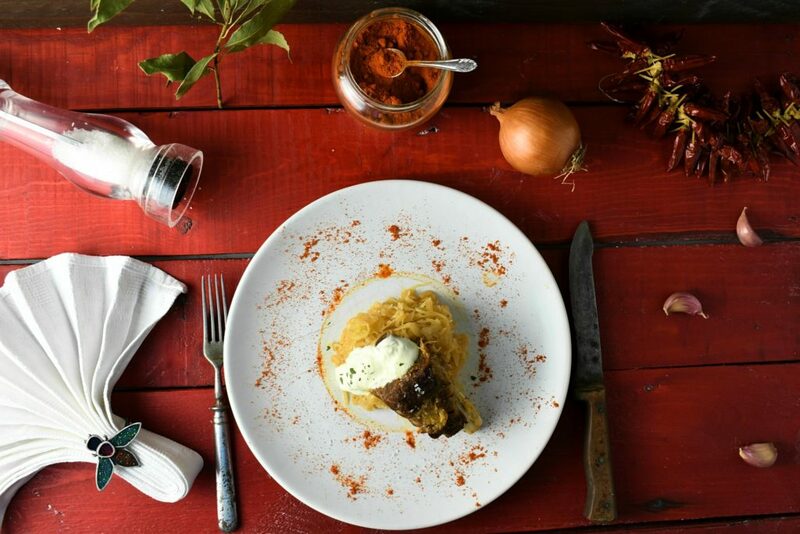 Sauerkraut is a lovely touch to finish a tasty sausage up but it can be so much more than just something on the side. With some care and love we can turn the plain sauerkraut into a lovely stew. Poles do know that and they have a special dish called Hunters Stew. It’s basically cabbage stew with sausage and meat. It worth a try but its only downfall it requires “kielbasa” a special polish sausage that’s fairly hard to come by outside of Poland. Ingredients can be substituted fairly freely in recipes though. Sure they modify the final taste or texture but that’s the beauty of cooking, anyway. Swapping pork to another meat of choice is absolutely possible. Cooking time of the meat then need to be adjusted accordingly. 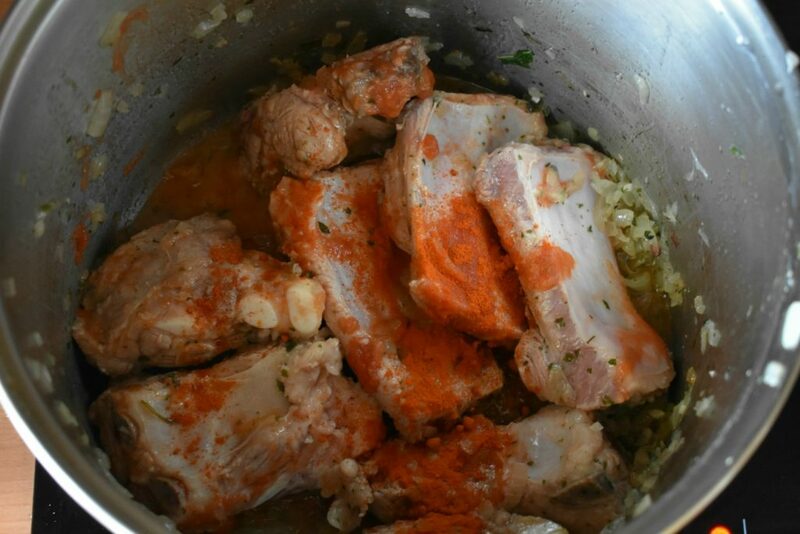 Generally beef needs a lot of time when prepared as a stew something around 2-4 hours while chicken needs much less. Diced chicken breast can be done in 20 minutes top while chopping up a whole chicken into 1″/2.5cm pieces (without boning it) takes around 40 minutes to cook. 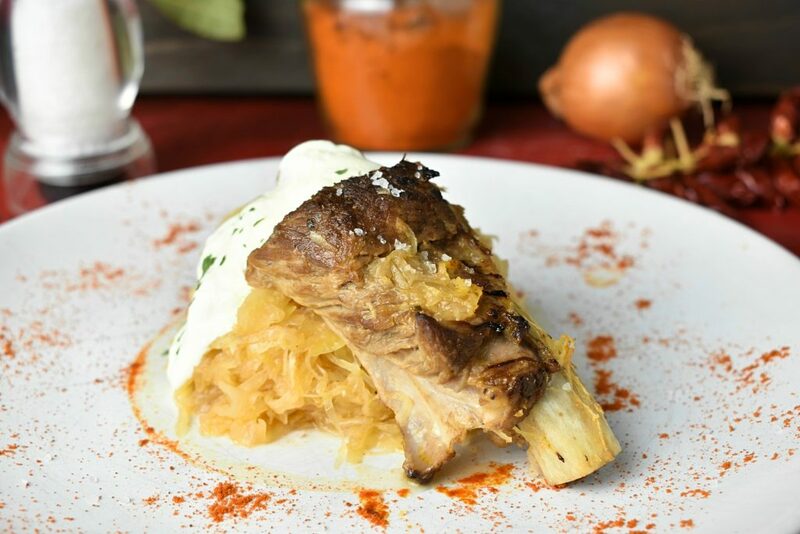 In this easy cabbage stew recipe any part of the pork can be used without problem. 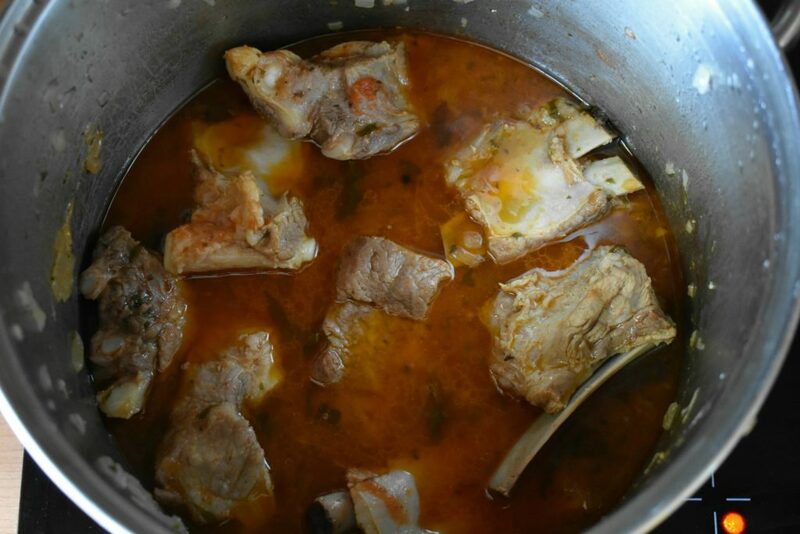 Parts with bones and diced up meat with some fat always taste better in stews. 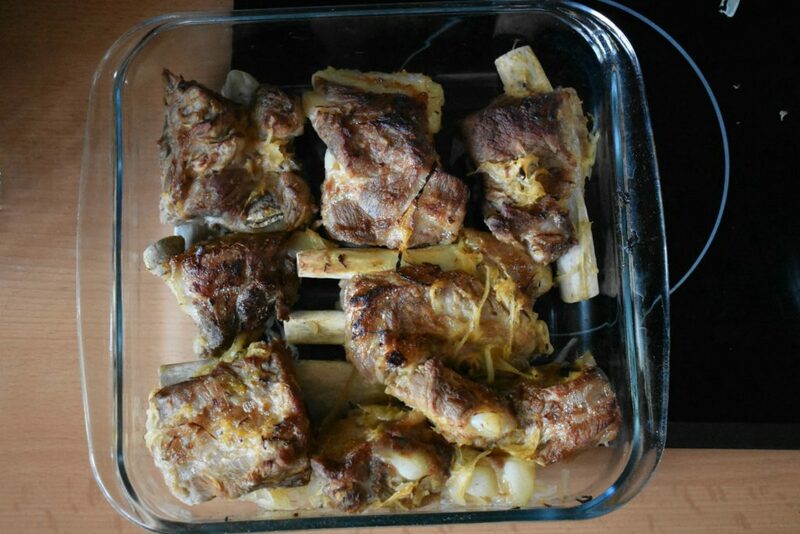 Pork knuckles and ribs are specially recommended to try out while mixing it up with some cubes of meat. Also a 2″ / 5cm long piece of Spanish Chorizo cut in two or sliced roughly could work wonders in a dish like this. Pour the oil into a big cooking pot and heat it up. 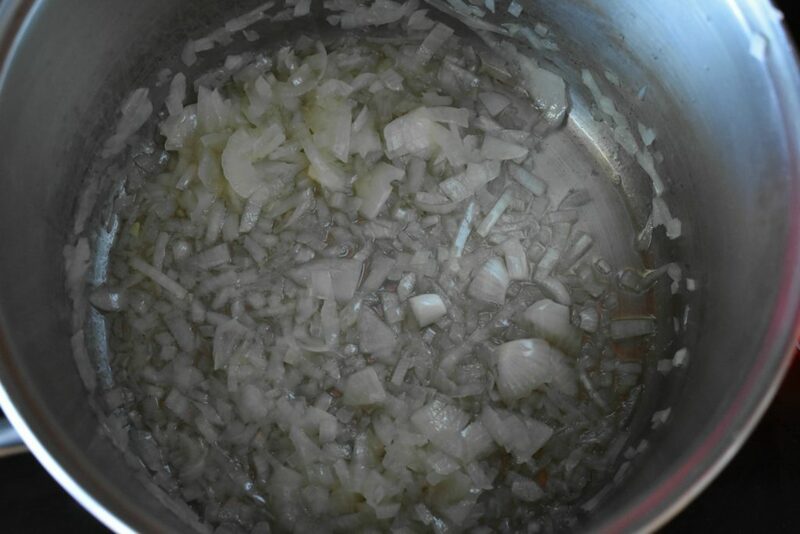 Add the diced onion and salt then saute it until it gets a translucent/glassy look. Add the pepper, diced garlic, parsley, bay leaf, basil. Fry it for a minute while stirring it as it is hot enough to burn down badly and that would ruin the dish. When the garlic and the herbs letting out a their first scents we are ready. 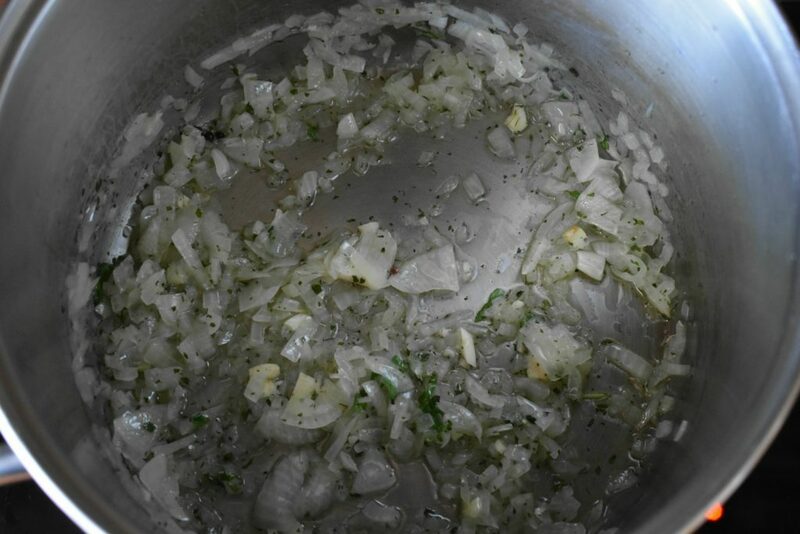 Add the pork and then try to stir most of the onion out from under the meat. Let the meat roast a minute or so while keeping an eye on the onion around it. When the meat gets a white or even sexier golden brownish color add the paprika, tomato. 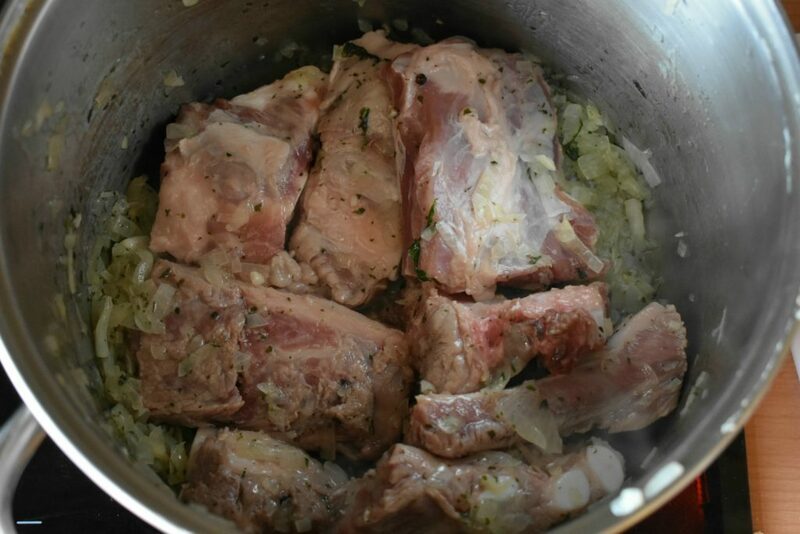 Add as much water to the pot as much would immerse half of the meat. Cook it in low temperature until soft and tender. This takes usually 1 – 1,5 hours. Not every sauerkraut have been created equal. Drain the sauerkraut from its brine if it’s too sour. A short rinse under the tap also would work wonders but keep in mind that this is a naturally sour dish. 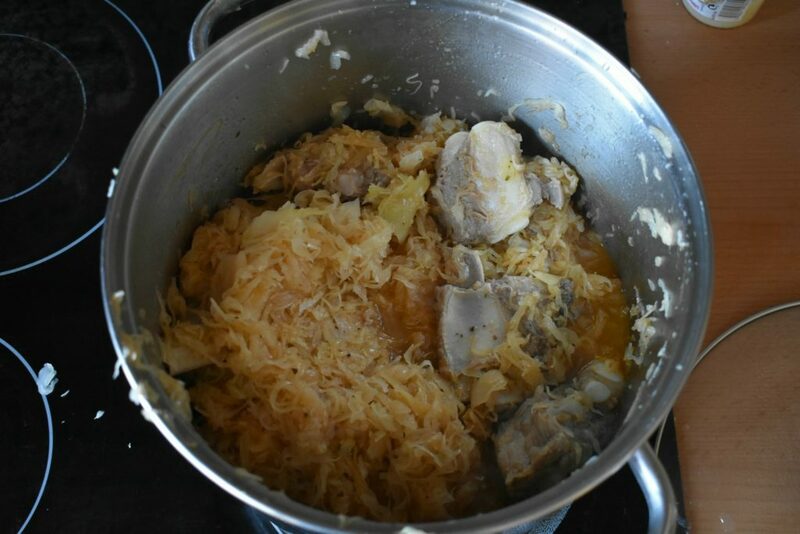 When the meat needs only 10 minutes or so to be ready add the sauerkraut and stir it together with the meat. Add some water until the food is around halfway under the broth. Bring it to boil and cook it for 2 minutes without the lid on on low heat. This allows some of the strong-smelling hydrogen sulfite gas that is emitted during cooking to dissipate. Put the lid back on then cook it for 8 more minutes. Sauerkraut is edible straight out of the jar so it doesn’t really need any cooking time. We only need to cook it for the flavors come together nicely. The dish is ready to be served but we can take the meat out and put it under the grill for a short time to get a more presentable color. Serve it with sour creme or creme fraiche on top. Some can’t imagine having it without a slice of bread or even better with some savory goodies like fluffy cheese scones. Cook it at low temperature until soft and tender. This takes usually 1 - 1,5 hours. Not every sauerkraut have been created equal. 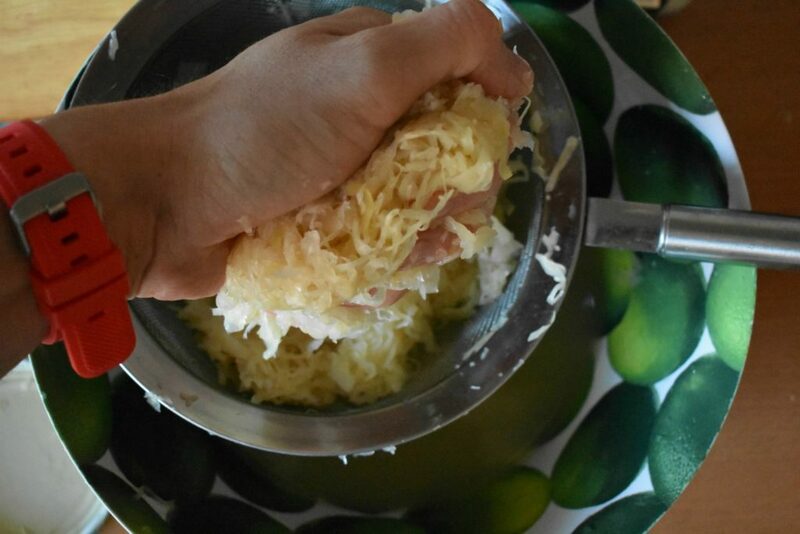 Drain the sauerkraut from its brine if it's too sour. A short rinse under the tap also would work wonders but keep in mind that this is a naturally sour dish. Add some water until the food is around halfway under the broth and cook it for 10 more minutes. Sauerkraut is edible straight out of the jar so it doesn't really need any cooking time. We only need to cook it for the flavors come together nicely. Serve it with sour creme or creme fraiche on top. Some can't imagine having it without a slice of bread or even better with some savory goodies like fluffy cheese scones.